This week’s Alexanderland post is a day late. That’s because yesterday, I spent a bit of time on Tumblr answering an enquiry about Alexander’s relationship with his mother, Olympias; did he love or hate her? If you would like to read the Q & A, you can do so by clicking here. For the second half-week in a row I have managed to read a little more of Alexander the Great’s Art of Strategy by Partha Bose and The Marshals of Alexander’s Empire by Waldemar Heckel. Napoleon, too, believed in the principle ‘When possible, always attack’. The function of strategy, according to generals like Napoleon and Alexander, was to make decisive contact with the enemy as soon as possible; everything would fall into place once that was done. There are two senses in which this statement can be understood – once the armies meet on the battlefield and as a general military principle. I am not quite certain which sense Bose has in mind. If he means ‘on the battlefield’, I agree with him. In his four major battles, Alexander never waited for either the satraps, Darius’, or Porus’ armies to come to him. He went to them. In doing so he took the initiative and never lost it. To give Porus his due, he at least managed to neutralise the advantage that taking the initiative gave Alexander, as may be seen by the scrum that developed between the two armies following the opening movements. However, if Bose’s statement applies to Alexander’s general strategy, I disagree. After Issus, Darius fled east and Alexander headed south to Tyre and Egypt. After Gaugamela, both kings repeated this move. After the battles at Issus and Gaugamela, Alexander knew that Darius was in no position to fight him so he had time to pursue his other expedition aims – it was not all about fighting – namely, the securing of the Mediterranean seaboard, the taking of Egypt after Issus, and the securing of Babylon, Susa and Persepolis after Gaugamela. … was now suffering from the powerful man’s conceit that he had seen engulf his father, according to which anyone who disagreed with him must be morally flawed. I haven’t read nearly enough about Philip II to confidently dispute this statement, but I have read enough to feel uncomfortable with this statement. As I sit here and write these words, the only time that I can recall Philip ‘suffering from the powerful man’s conceit’ is in the placement of a statue of himself alongside those of the Olympian gods (Diodorus XVI.95). I don’t know of any occasion when he regarded those who held different views as ‘morally flawed’. Moving on to The Marshals of Alexander’s Empire. I am still in ‘Chapter ii: The ‘New Men”. Earlier today, I read about Leonnatus. I have to admit, not much really jumped out at me while I read this; with that said, two statements did make an impression on me. Pithon began to follow Perdiccas’ strategy, designating Perdiccas and Leonnatus, both of royal birth, as guardians for Roxane’s future son. This passage is, therefore, a reminder to me never to limit myself to just one of the sources. If I can I always need to look up what the others say. As for Leonnatus at Babylon, Weckel says that the reason Peithon nominated Leonnatus was to keep Perdiccas’ ambitions ‘in check’ (p.104), which sounds about right. Heckel quotes Helmut Berve in his summary of Leonnatus. According to the latter, he ‘was a potential unfulfilled’ (p.106). He was a late comer, too, not being promoted into the senior ranks of the Macedonian army until 332/1 when he became a somatophylake and did not receive his first ‘military command’ (p.98) until early 327 when Alexander put him in charge of the night crew as the Macedonian army worked round the clock to bridge the rock of Chorienes. Leonnatus reminds me of Ptolemy, whose rise through the ranks was also delayed – for the son of Lagus, it did not begin until late 330 when he, too, became a royal bodyguard. However, though Ptolemy joined the senior ranks later than Leonnatus, he enjoyed his first solo command earlier – the pick up of Bessus in 329. Both Ptolemy and Leonnatus had blue blood in them, although I believe Ptolemy was minor nobility. Leonnatus was a member of the Lyncestian royal house and related to Alexander through the latter’s grandmother. Ptolemy’s and Leonnatus’ paths definitively diverged in the Wars of the Successors. Leonnatus died at the start after falling in battle against the Athenian general Antiphilos in 322 B.C. while Ptolemy secured himself in Egypt and very nearly outlived the wars, dying in 283 B.C. My continued thanks go to Shiralyn Mayon who linked to the following two videos on my Alexander Facebook page. The first is a short clip from a History Channel documentary about Alexander. It focuses on his relationship with Hephaestion. The video claims that Alexander met Hephaestion in early adulthood. To the best of my knowledge, we do not know when they met. They could have been boyhood friends. The rest of the video is is concerned, firstly, with how Philip II and Olympias feared that their son was a ‘femme (?) homosexual’ and so introduced him to ‘call girls’ to man him up some. And secondly, Peter Green wonders what do you do if you are a ‘feminine youth’ and your father is an ‘ultra masculine, heavily bearded, militarily successful, hard drinking, dominant alpha-male’. The answer, of course, is you never stop being slightly feminine, nor reject the one you love but play the same military game as your father and beat him at it. The second video is an advert for a 2012 exhibition based on Alexander. I don’t have much to say about it except that it does a great job of making the exhibition worth going to see. Warning! In this post I reveal the answers to a quiz I held on The Second Achilles‘ Tumblr page on Monday. If you would like to play the game, visit click here and here as the answers to the quiz are below. Hello to anyone who is visiting this blog from her Tumblr page. Below you will find the answers to Monday’s little quiz plus some extra comments by me. Before getting to them, I must apologise to anyone reading this who would have liked to have to taken part in the quiz but saw the answers before following the links above. I should have mentioned the quiz on the blog on Monday but didn’t. I will certainly do so in the future. Without further ado, let’s ‘name that officer‘. The man injured alongside Alexander and then by the Indian chief was, of course, Ptolemy. For two bonus points I asked which Alexander historian(s) I used for the story and what happened next. My source is Arrian. Here is how he describes the incident, and what happened next. Alexander’s next objective was the territory of the Aspasians, Guraeans, and Assacenians… Attacking the first of [the] towns which lay on his route, [Alexander] had no trouble in driving in the force which was stationed outside, and compelling the men to take refuge within the defences; but during the operation he was wounded in the shoulder by a missile which pierced his corselet. The wound was not serious, as the corselet prevented the missile from going right through his shoulder. Ptolemy, son of Lagus, and Leonnatus were also hurt. … after a long march [Alexander] reached on the second day the town where the governor of the Aspasians was. The natives were no sooner aware of his approach than they fired the town and made their escape to the hills, with Alexander’s men in hot pursuit all the way. Many were cut down before the rough hill-country enabled them to shake off their pursuers. During the pursuit, Ptolemy, son of Lagus, actually spotted the chief of the Indians of this district: he had already reached a hill and was trying to get away with some of his guards. Ptolemy, though he had a much inferior force, nevertheless rode for him; but it was too steep and too rough going for his horse, so he dismounted, gave it to a man to lead, and continued to chase the Indian on foot. Seeing him coming, the Indian and his guards turned to face him. They met; and the chief struck Ptolemy in the breast with his long spear, which pierced his corselet but did not penetrate his body. With a blow clean through the Indian’s thigh, Ptolemy laid him flat, and began to strip him, whereupon his guards, seeing that their chief was down, turned and fled. Other Indians, however, on the neighbouring hills, grieved at the sight of their leader’s body being carried off by the enemy, came hurrying down, and a fierce struggle ensued over the corpse. By then Alexander and his cavalrymen, now dismounted, were not far from the hill; they joined in the melee and finally succeeded in driving the Indians into the hills and getting possession of the body. Apart from Ptolemy’s heroism and very traditional action of stripping the Indian chief of his armour, what made a strong impression on me when I read this passage was the similarity between his and Alexander’s injury. The Macedonian king was struck by a missile, which pierced his corselet but which did not go through his body. If there was a chance of that happening, I presume the missile was a spear of some description. Well, fast forward and we find Ptolemy also being struck by a spear, which also pierced his corselet, but which did not enter his body. This one, however, did not penetrate his flesh. Was Ptolemy using an injury he received on this occasion to create a(nother) link between himself and the late king, and perhaps even to prove himself in a sense greater than him by saying ‘he was injured but I wasn’t’? That’s Ptolemy, now let’s ‘name that nationality‘. Firstly, in case you are wondering why I didn’t ask readers for the woman’s actual name, it’s because Arrian doesn’t provide it. As for her nationality, the woman was Syrian. The bonus questions asked the reader to name Arrian’s source for the story and, again, to say what happened next. The source is Aristobulus. As for what happened next – the simple answer is that the young men’s plot unravelled. Here is how Arrian described all that happened. … on the night in question Alexander sat up drinking until dawn. This may have been pure chance, though Aristobulus has a different explanation. According to him, there was a certain Syrian woman with the gift of second sight, who kept following Alexander about. He and his friends used to laugh at her; but, as time went on and everything she foretold in her trances turned out to be true, Alexander began to feel differently. He no longer found her a figure of fun, but let her come to him whenever she wished, by day or night, and on many occasions allowed her to watch over him while he slept. This woman, in one of her prophetic trances, met him as he was coming away from his potations. She begged him to go back and drink the night out, and Alexander, convinced that there was something more than human in the warning, took her advice. So the boys’ plot fell through. Epimenes, one of the guilty ones, also, like Hermolaus, had a bosom friend, Charicles, son of Menander; and to him, on the following day, he told the whole story. Charicles told Epimenes’ brother, Eurylochus, who went to Alexander’s tent and passed everything on to Ptolemy son of Lagus, of the King’s Guard, who, in his turn, told Alexander. Alexander ordered the arrest of all the boys whose names were given him by Eurylochus. Questioned under torture, they admitted their guilt, and at the same time implicated certain others as well. There are two things I would like to highlight here. Firstly, Alexander’s trust in the woman. She was not only permitted to enter into his presence whenever she wished, but even to watch over him while he slept. He really must have trusted her very deeply indeed. Secondly, notice how Ptolemy informed Alexander of what Eurylochus told him straight away. Compare that to Philotas’ vacillation. This story takes place after Philotas’ downfall so it would not surprise me if Ptolemy had Parmenion’s son in mind when he went to see Alexander. As the Macedonian fleet continued its journey down the Indus River, it met with a very awkward problem: its guides ran away. The soldiers guarding them had become complacent, and this allowed the natives who had been coerced into guiding the ships to flee. Alexander ordered more guides to be found but when none were his impatience to see the ocean got the better of him. At his command, the fleet set sail again ‘in complete ignorance of the terrain through which they were passing’. Neither did they know which tribes lived here, nor how far they were from the sea, or how dangerous the river-mouth was. Indeed, for all they knew, the Indus would not even bring them to the sea. It was a recipe for disaster, and disaster very nearly came. Presently, the smell of sea air wafted past the Macedonians. At the same time, they finally caught some natives. These informed Alexander that the sea – which they knew only as a ‘bitter-tasting water’ – was just two days away. Delighted at this news, the Macedonians ‘put tremendous vigour into their rowing’ and, sure enough, two days later, they came to where the sea and river water mixed. A ‘gentle tide’ greeted them. Ahead of the fleet was an island. Alexander landed there to look for provisions. Curtius says that at ‘about the third hour’* the tide started to come in and that, having no knowledge of tidal movements, the Macedonians thought the gods were showing their displeasure at them. The island began to disappear underwater, and the men hurried back to their boats; in their panic they got in each other’s way as they clambered into the vessels. Some ships were overloaded, while others left the island before every crew member had returned. Panic gripped the men. When the ships took to the water, they collided with one another, knocking oars out of place. There were arguments and fights. Some men abandoned their vessels and made for the spots of land that remained above water. As all this was going on, the tide turned. This volte-face disturbed the Macedonians just as much as the rising tide had. What would happen next? The men ‘foresaw starvation and utter catastrophe’. If the water didn’t get them, they feared that the ‘sea monsters wandering around’ – beached by the departing tide – would. It was night time and Alexander had no idea what to do next. Unlike his men, however, he did not panic. He gave thought to what had happened and worked out that the tide was rising and falling in accordance with ‘the laws of time’. Realising this, he sent men to the river mouth so that they could ride back and give warning of the next high tide. As for the men, he ordered them to repair the ships in readiness for the tide’s return. Alexander spent the night maintaining his own watch and encouraging the men in their labour. As a result of his courage, when the tide came rushing in again, the men boarded their vessels and greeted the rising water with cheers rather than cries. Once afloat, Alexander took his ship out into the ocean before returning to the fleet ‘after sacrificing to the tutelary gods of the sea and the locality’. Returning upstream, the Macedonian fleet arrived at a salt like. There, some men contracted a skin disease after coming into contact with the water. They were cured by [olive?] oil. Alexander intended to continue his journey west by land. As it was arid he ordered Leonnatus to march ahead of the army and dig wells for it. 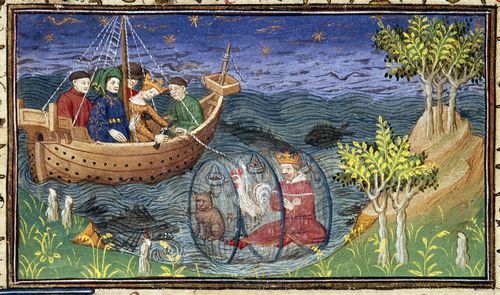 ‘Nearchus and Onesicritus, who were expert seamen’ were given orders to go back downstream and go as far as they could into the ocean ‘to examine the sea’s characteristics’. They were told to either return to Alexander or continue on to the Euphrates. After a twenty-two day march, Alexander passed the Arabus River. In doing so, he entered desert country. This brought him to the country of the Horitae. There, he split the army in four – giving ‘the major part of his force to Hephaestion’ and dividing the remaining troops – all light-armed – between himself Leonnatus and Ptolemy. As they marched (Ptolemy along the coast, Alexander, and Leonnatus inland*) the armies looted native settlements and set the country ablaze. Further along, Alexander met an isolated people who built their homes with the detritus of the ocean. Following this, the Macedonians’ provisions ran out; they were forced to eat their pack animals and horses. Plague struck the column, and the dying as well as the dead were left by the wayside. Alexander wrote to neighbouring governors for help. They quickly sent it. (In Carmania) the emergency rations were replaced by wine – and lots of it. Much to Curtius’ disgust, the army continued its journey drunk and disordered, ‘why, a mere 1,000 men, if sober, could have captured this group on its triumphal march’. Thus spoke Angry of Rome. Alexander entered ‘the country of the Oreitae (Oreitis?). Diodorus has more to say about Oreitaean customs than he does about Alexander’s campaign against that people. This is partly because fighting the Oreitae proved easy, and the country was ‘quickly brought… into submission’, and partly because the specific custom to which he refers was such an unusual one. Diodorus describes how the Oreitae leave the naked bodies of their dead in thickets apparently so that wild animals can eat them. The relatives of the deceased then divide up the dead person’s clothing between themselves, ‘sacrifice to the heroes of the nether world,’ and host ‘a banquet for their friends’. From Oreitae, Alexander made his way to Cedrosia. There, he travelled close to the shore line. Diodorus doesn’t tell of any military action taking place in Cedrosia, although if the Macedonians found the going easy in the country of the Oreitae they would not have been troubled by the Cedrosians. The people, Diodorus says, were ‘unfriendly and utterly brutish’. This savagery seems to pertain to their personal habits rather than what they were like as warriors. For, with admittedly no small amount of hyperbole, Diodorus says that the Cedrosians let their nails ‘grow from birth to old age’ and that they never washed their hair. He adds that they were heavily tanned and dressed ‘in the skin of beasts’ – as stereotypical a sign that someone is a savage as ever there was. The Cedrosians may have been very primitive but they knew how to make the best of their limited resources. They not only wore animal skins, but ate ‘the flesh of stranded whales’, which had died on their beaches. Furthermore, they used whale bones to build their homes. This went as far as using whale scales as roof tiles. A very clever feat, of course, since – as the Footnotes point out – whales do not have scales. Alexander made his way through Cedrosia ‘with difficulty’. Not because of the people, but because he was short of supplies and was now marching through a desert. The going proved so hard that the army became ‘disheartened’ and Alexander himself ‘sank into no ordinary grief and anxiety’. The king sent messengers to Parthyaea, Dranginê, and Areia to seek supplies. The messengers delivered their orders and provisions were forwarded on. They did not, however, arrive in time to prevent the loss of many soldiers. They never could have. These losses were brought about not only by the dreadful conditions and Alexander’s bad planning, but because the Oreitae launched what must have been a surprise attack on Leonnatus’ division, inflicting ‘severe losses’ before escaping home. Diodorus calls the Oreitae habit of exposing the bodies of the dead to be eaten by wild animals ‘strange and quite unbelievable’. Certainly to our eyes it is most unusual. If I was the Oreitaeans’ PR man I’d point out (a) the decomposing body is kept away from the community so one cannot oppose it on hygiene grounds, and (b) by being eaten it both highlights and makes a practical contribution to the well-being of the environment. What’s the difference between being eaten by a worm and wolf, anyway? I’m afraid I would find it harder to be the Cedrosians PR agent. Overgrowing finger and toe nails, unwashed hair, skin ‘burned black’ by the sun. And how they must have smelled of whale! Yuk. Well, if anyone can defend the Cedrosians I’d love to see it. I was very interested by Diodorus’ statement that Alexander ‘sank into no ordinary grief and anxiety’. I read this as Diodorus saying that he became depressed. Alexander was, it seems, prone to anxiety. A quick google search for references on this blog to him being anxious shows that he suffered from anxiety on at least two occasions. (ii) Plutarch 47 In Hyrcania when he worried over whether his army would continue to follow him – read here. I have to say, though, neither of these occasions are presented in such a way as to make me feel Alexander suffered from anxiety as a serious mental health disorder. On both occasions he was anxious in the way someone would be in a high pressure situation. In other words, he was anxious, the moment passed and he moved on. By contrast, what Diodorus describes feels really quite different. It foreshadows, in a way, the extreme emotion that Alexander will feel when Hephaestion dies (and which Diodorus explains in two simple but foreboding words. Alexander, he says, ‘intensely grieved’ [Chp. 110] for his friend. Arrian goes into greater detail about how he grieved [Bk 7. Para 14]). I’m used to reading that Alexander became a megalomaniac in his later days – do we have any justification of suspecting that all along he was prone to anxiety attacks, which in Gedrosia developed into a more serious – even if not clinical – depression? I need to improve my medical knowledge before attempting to answer that question. In the summer of 325 B.C. Alexander’s fleet sailed out of the mouth of the Indus River and into the Indian Ocean. Diodorus reports that he found two islands in the process. He landed on each and ‘performed rich sacrifices’. Altars to Tethys and Oceanus were built and ‘many large cups of gold’ thrown into the sea after libations had been poured from them. Leaving the islands, Alexander sailed to the city of Patala. A couple of posts ago we read about the city of the Sambastae, which was ‘governed in a democratic manner’. If this city was the Athens of the east, then it seems Patala was the Sparta. For there, ‘[t]wo kings descended from two houses [and] inherited their office from their fathers’. The two kings had authority over of all matters relating to war ‘while the council of elders was the principal administrative body’. Some of Alexander’s ships had become damaged by the journey down the Indus river and into the ocean (see here for an example of how damage occurred). Repairs had been carried out, but now, Alexander burned all those that had become damaged again. The remaining vessels were given ‘to Nearchus and others of [Alexander’s] Friends’ who were ordered ‘to coast along through the Ocean’ making observations before meeting the king at the mouth of the Euphrates River. As the ships set sail once more, Alexander led the army inland. He ‘traversed much territory and defeated his opponents’. Those ‘who submitted were received kindly’. The Abritae and ‘tribesmen of Cedrosia’ are named as having willingly submitted. Alexander’s march took him across ‘a long stretch of waterless and largely desert country’ right up to the border of Oreitis. Upon his arrival there, the king split the army into three divisions under his own, Ptolemy’s and Leonnatus’ command. Ptolemy was ordered ‘to plunder the district by the sea’, while Leonnatus was told ‘to lay waste [to] the interior’. As for Alexander, he ‘devastated the upper country and… hills’. The country ‘was filled with fire and devastation and great slaughter’. The Macedonian soldiers won ‘much booty’. The neighbours of the destroyed tribes ‘were terrified and submitted’ to Alexander. When all was done, Alexander decided to found another Alexandria, and he did so in a ‘sheltered harbour’. Diodorus doesn’t give the date at the start of the chapter – that comes from the Footnotes, which cite Strabo. Theoi is a good source of information about the ancient Greek gods. Here are their entries for Tethys and Oceanos. It is quite a distance from the mouth of the Indus to Euphrates Rivers though perhaps it would not have seemed so far to the Macedonians given that they believed the world was a smaller place? I have to admit a little confusion here. Diodorus says that Alexander led his men ‘as far as the frontiers of Oreitis’. I have assumed that his campaign against the tribes took place in that country. In Chapter 105, however, Diodorus describes Alexander as advancing ‘into the country of the Oreitae’ whose name is too similar to Oreitis to be a different people. Perhaps the campaign took place on the frontier itself or in no-man’s land between Oreitis and the region he had just passed through? Diodorus does not mince his words when talking about Alexander’s campaign, and it sounds absolutely ghastly. The way he talks about Alexander’s ‘destruction of the tribes’ makes it sound like a genocidal action taking place. But what had the natives done to deserve such treatment? Maybe they had done nothing. I imagine they must have resisted Alexander, however, causing him to turn savagely against them. Alexander kept up his pursuit of Darius until late into the night. Diodorus says that the Macedonian king and his cavalrymen rode for two hundred furlongs before turning back to his camp. Unfortunately, the Footnotes do not say how long a Greek furlong is so it is hard to put Alexander’s ride into context. Google tells me that one furlong today is 201 metres. This website gives two hundred furlongs as the equivalent of twenty-five miles. If that is how far Alexander travelled, it is quite a distance given their earlier exertions. I realise, though, that this is a big if. Alexander arrived back at his tent around midnight. After a bath to wash off the day’s blood and grime, he sat down to dinner. As he ate, the Persian royal family were informed that Alexander had returned to camp ‘after stripping Dareius of his arms’. The women broke down in tears at this news. They were joined by the other captives, and the noise became so loud that Alexander had to send Leonnatus to the royal family’s tent ‘to quiet the uproar’. Leonnatus assured the women that their lord was still alive ‘and that Alexander would show them… proper consideration’. The queens were calmed by this news. In their relief, they ‘hailed Alexander as a god’. By the time he had bathed and finished eating, Alexander could only have had time for a few hours rest for at daybreak he was up again and on his way to see the royal family. Alexander entered the queens’ tent with several of his Friends, including Hephaestion. Diodorus states that both he and Alexander ‘were dressed alike’ but that ‘Hephaestion was taller and more handsome’. This lead Sisygambis, Darius’ mother, to assume that Hephaestion was Alexander and so ‘did him obeisance’. Some of Alexander’s Friends ‘made signs to her and pointed to Alexander’. Realising her mistake, and no doubt blushing with embarrassment, Sisygambis turned to the king. What did Alexander mean by this? The Footnotes say that his response ‘recalls the proverbial Greek definition of a friend as a “Second Self”‘. This makes ‘he too is Alexander’ seem hardly more than a poetic way of saying ‘he is my friend’. We would not be doing the two men justice, however, if we did not qualify the nature of their friendship. An opportunity to do that will come in Chapter 47. If you have a copy of Diodorus to hand, you might also look at Chapter 114. I shall leave of discussing either until the appropriate post. For now, I would say that when Alexander called Hephaestion by his own name he was indicating that theirs was a very personal friendship (for the avoidance of doubt, I don’t think he was indicating that they were lovers). Alexander called Ochus to him and kissed him. Ochus ‘was fearless in [his] countenance’. Turning to Hephaestion, Alexander ‘remarked… that at the age of six years the boy… was much braver than his father’. Ochus’ mother, Stateira I was not forgotten about. Alexander promised her ‘that she would experience nothing inconsistent with her former happiness’. The royal women cried with joy for Alexander’s kindness towards them. Diodorus says that the king ‘won universal recognition throughout his own army for his exceeding propriety of conduct’. I wonder if this included the men who had dragged the other Persian women by their hair or stripped them naked and hit them with their spear butts. Diodorus concludes the chapter by applauding Alexander’s actions. ‘Most people are made proud by their successes… and becoming arrogant in their success, are forgetful of the common weakness of mankind’. Alexander, however, had wisdom. ‘[L]et him continue to receive in future ages… the just and proper praise for his good qualities’. Amen to that. As facetious as it is, I am glad that even Alexander knew what it was like to have a noisy neighbour. If only ours could be as easily dealt with! I am not sure what ‘stripping Dareius of his arms’ means. It isn’t literally true – Darius escaped Issus with his own weaponry and had access to more. It isn’t true in terms of the Persian army: whether or not Darius escaped by riding over the bodies of his men, as Ptolemy fancifully states, many Persians escaped. Perhaps it is simply a metaphor for the Persian army’s defeat? I note that when Alexander visits the queens’ tent he speaks first to Sisygambis, and it is she who does obeisance to him. I wonder if this means that in the Persian hierarchy the Queen Mother was more senior to the Queen herself? Diodorus says that Alexander assured Sisygambis ‘that she would be his second mother’. Surely she is his third after Olympias and Ada!